I was trying to merge two folders on Yahoo Bookmarks into a single bookmark list. When I checked the drop down list, all of the contents from both folders were listed. So, I thinking I can now delete the two folders, selected delete folder. I checked the bookmark drop down list again and all the contents from the two folders are now gone. 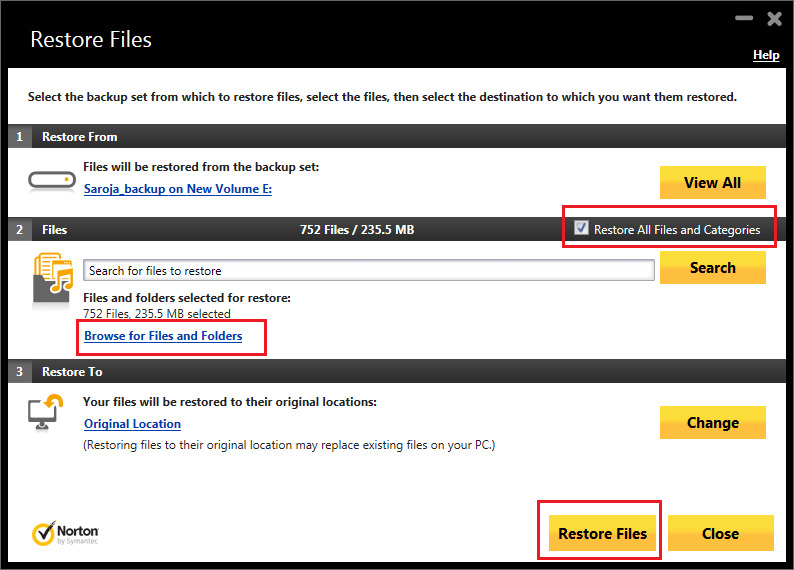 Is there a way I can go back to an earlier Norton backup and retrieve the individual folders i deleted from Yahoo Bookmarks? And if so, what is the process or procedure to do so? Could you please provide details of your Norton Product(NIS or N360) and which version? The Norton product I have is Norton 360, purchased September 6, 2013. I would think it is the latest version. Can you explain what is Norton Main UI? I will attempt your suggestion to retrieve the files. 2. 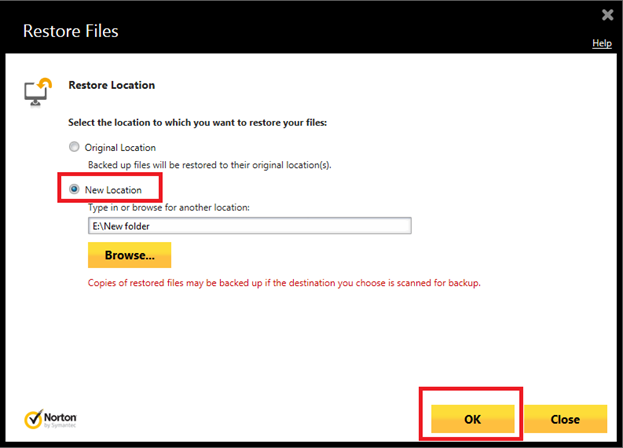 Once you click on restore Files link, you can see the screen below, Please check ‘Restore all Files and categories’ check box if you want to restore all files or select the files using ‘Browse for files and folders’ Link and then click on ‘Restore Files’ button. I want to sincerely thank you for your time and assistance. All of your answers and suggestions work absolutely great. But I must confess, I know nothing about selecting files or folders, or even what file or folder I need to search for. I went through all the files, then I tried select folders, but I have no idea what to select to restore. All I can explain is that I would like to restore my Yahoo Bookmarks created on the Yahoo toolbar. 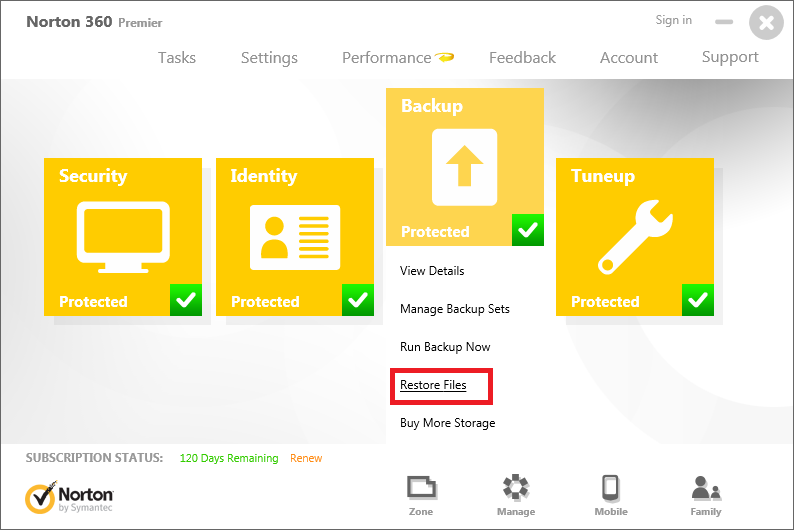 I saw I can select 10-09-13 backup, where I can select restore all, and it would not cause a problem with any other files or folders, except Norton 360 files and any other files attached to it. I had a Service Representative go through and update my Norton 360 and he deleted some old Norton folders and files, so I would like my Norton settings to be as they are currently. 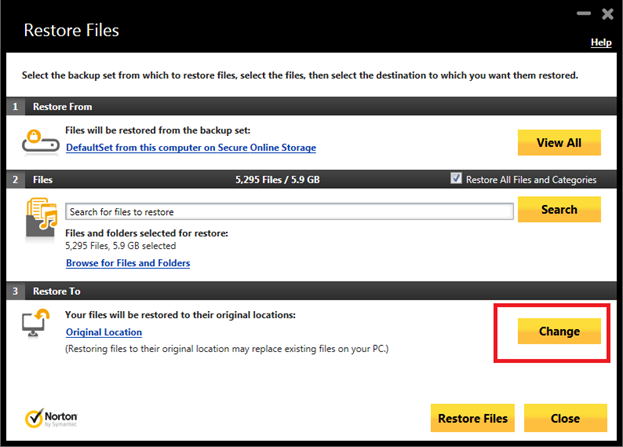 If I can not select Restore All and not affect my Norton files and settings, then I would be willing to do so. If not, if you could possibly teach me what individual files to select, I would be so grateful.